Summer lupine bloom on a hill overlooking the bay in Blue Hill, Maine. Whether you prefer water sports or antiquing, country fairs or art galleries, fresh lobster or chamber music, you won’t want to miss Blue Hill and the surrounding towns of Brooklin, Brooksville, Castine, Penobscot and Sedgwick on your next trip to Maine. The first European settlers arrived in the area in 1762, drawn by the region’s potential for maritime and shipbuilding industries. By 1859, after the construction of saw and grist mills, the region became an important center for firewood, shingle and lumber production, while local quarries produced granite used in a number of notable structures, such as the New York Stock Exchange and the Brooklyn Bridge. Today, this scenic region attracts visitors and residents with its rugged natural beauty, outdoor recreational activities, and cultural and historical attractions. Blue Hill, named for the mountain that rises near the town, has a population of just over 2,300 people, but despite it’s small size, it’s an important cultural center in the region. The Kneisel Hall Chamber Music School draws music lovers with its annual summer music festival. The event features acclaimed musicians from around the world, as well as the talented students that attend the school. Kneisel Hall also offers a regular schedule of musical performances throughout the year. For more live performances, take in a show at the New Surrey Theatre and Performing Arts School. Since 1972, this Blue Hill institution has hosted theater productions featuring international acting troupes as well as local artists. Learn about Blue Hill’s rich past at the Blue Hill Historical Society’s museum. Set in Holt House — built in 1815 by one of the area’s founding families — the museum contains a range of period furnishings and artifacts, as well as a restored carriage house and a room full of children’s toys and other town memorabilia from the last three centuries. For more insight into the region’s history, stop by the Jonathon Fisher House. This 1814 homestead recreates the life of Blue Hill’s first Congregational minister, who also dabbled in farming, painting, poetry and science. Known as the “Versatile Yankee,” Fisher’s house contains period art, furniture, a library and several of his inventions, as well as a recreation of his orchard and gardens. Outdoor enthusiasts will find Blue Hill to be a recreational Mecca; its proximity to both ocean and mountains creates the perfect venue for a number of sports and activities. Hikers can explore the trails that crisscross the surrounding area, such as the Blue Hill Loop with its stunning views of Blue Hill Bay, the Acadia Mountains, and blueberry and raspberry bushes for snacking along the way. For more walking, biking and cross-country skiing, visit the Kingdom Hill Conservation Area. One of several preserves maintained by the Blue Hill Heritage Trust, this wilderness area encompasses 800 acres with three miles of trails and a 50-acre, undeveloped pond that’s perfect for kayaking or canoeing. Summer visitors won’t want to miss the Blue Hill Fair. Each year around Labor Day weekend, the community comes together to celebrate the area’s agricultural and cultural traditions, from livestock shows to arts and crafts exhibits, carnival rides to live entertainment. Later in the fall, the annual Foliage Food and Wine Festival takes place across the Blue Hill region. For 12 days, fishermen, farmers, chefs and greenhouses come together in multiple venues to display their tasty wares. The town of Brooklin is surrounded on three sides by water — Blue Hill Bay to the east, Eggemoggin Reach to the southwest, and Jericho Bay to the south – and sits on the banks of the Benjamin River. It’s proximity to the water makes it a paradise for those who love the sea – and fresh seafood. In fact, Brooklin is perhaps best known for its long tradition of wooden boat building; the town is home to both the Wooden Boat School, which offers sailing and woodworking courses, and Wooden Boat Magazine. Each year since 1985, the Eggemoggin Reach Regatta draws more than 100 wooden boats to race a 15 mile course. Brooklin is also well known for its archeology; the town is the site of several significant digs that have unearthed artifacts from the prehistoric Red Paint Peoples to a Norse coin dating from the 11th century. This scenic town was also home and muse to author E. B. White, perhaps best known for his childhood classics “Charlotte’s Web” and “Stuart Little.” Today, the E.B. White house is listed on the National Register of Historic Places, along with Brooklin’s Beth Eden Chapel, which dates to 1900. Brooksville’s history stretches back to 1817, when it was settled by three Revolutionary War soldiers. In the following years, the town developed as a center for granite quarries, agriculture, textile production and fisheries, thanks to its safe mooring available in the deep waters of Buck’s Harbor. The town also sits on the Bagaduce River, Eggemoggin Reach and Penobscot Bay. Today, Brooksville attracts outdoor enthusiasts with its gorgeous coastal scenery and recreational attractions like Holbrook Island Sanctuary, a preserve on Penobscot Bay that offers hiking and cross-country skiing trails, picnic areas and plenty of waterfront for canoeing and kayaking. It’s also home to a range of wildlife, from otters and muskrats to fox and bobcats. The Maude E. and Eugene Snow Natural Area encompasses 40 acres of forest and offers two loop trails that follow along the Bagaduce River, and the Ferry Landing Natural Area offers an easy, 1-mile walking trail through forests and old homestead fields. History buffs won’t want to miss Castine; after all, the town was settled in 1604 and is among Maine’s oldest cities. The town contains more than 100 historic sites, including many gracious old homes with 1700s architecture, and three forts that played important roles during the American Revolution: the 1625 Fort Pentagouet, the 1779 Fort George and Fort Madison. Visitors can learn more about Castine’s past at the Wilson Museum, which contains cultural and natural collections from around the region and the world. The museum also houses a reconstructed kitchen and parlor from the Victorian era, as well as a 19th century blacksmith shop and the 1763 John Perkins House. Castine is also home to the Dice or Dyce Head Light. The 42-foot-tall lighthouse houses a 1,000 pound fog bell has watched over Penobscot Bay since 1829. Penobscot sits on the Bagaduce River and was first settled in 1760. The area is known for its hunting, fly fishing and ice fishing, as well as excellent canoeing, kayaking, sailing and boating along the town’s 18 miles of shoreline along Northern Bay as well as nearby Toddy, Wight and Pierce Ponds. 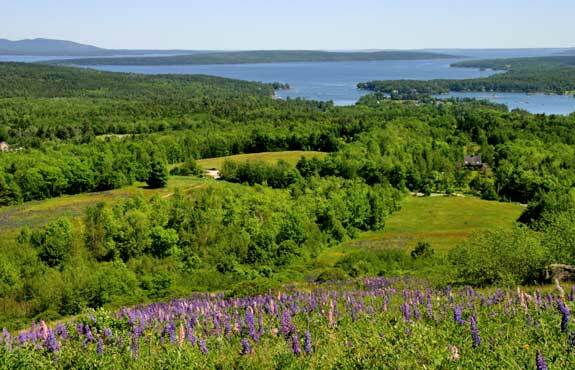 Sedgwick’s claims to fame include one of the most photographed views in the state: From the top of Caterpillar Hill, hikers can see west to Penobscot Bay, east to Jericho Bay and south to Isle de Haut. Other recreational venues in Sedgwick include Cooper Farm at Caterpillar Hill, which offers 2 miles of trails through blueberry fields and wooded areas, and canoeing on Salt Pond and the Bagaduce River. The area also attracts bird watchers. Sedgwick was settled in 1763, although some archeological evidence indicate that the area may have been settled by Europeans before Columbus ever arrived. Visitors can learn more about the town at the Sedgwick-Brooklin Historical Society Museum. Set in the 1795 home of the town’s first minister, the museum is open in summer and contains the Town Meeting House and the Sedgwick Rural Cemetery. Blue Hill and its neighboring towns offer a variety of accommodation choices, from cozy bed and breakfasts and oceanfront inns, mom-and-pop motels to national chain hotels. Dining options are equally diverse. Whether you prefer to dine on fresh seafood on a deck overlooking the ocean, feast on locally grown produce at a co-op, or simply grab some fast food on your way to your next adventure, the Blue Hill area’s many eateries will satisfy your appetite. Visit the following directories to find lodging, dining, attractions, shops, services and recreational activities in the Blue Hill, Maine area.